Intel Atom 1.6GHz, Display: 8.9", WLAN: 802.11n, Bluetooth, 1GB DDR2, SSD 12GB (Genuine Windows® XP Home), SSD 20GB (Linux), 1.3M Pixel, Dolby Sound Room Certified, Stereo speaker, Digital Array Mic, 6 Cells, 4.2 ~ 8 hrs (XP Home), 6 Cells, 4.5 ~6 hrs (Linux), Weight: 2.1lbs, Genuine Windows XP Home, GNU Linux. 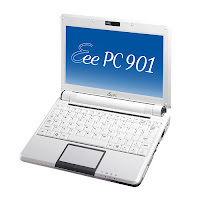 Download links for Asus Eee PC 901 Drivers is provided by DriverDir.Com a Drivers laptop and PC encyclopedia. "All of the links in this site, are connected to official website of laptop and their name of brand, so all of contents in this this site are legal, and will not damage your laptop or your hardware."